Home » Is Gold A Bubble About To Burst? Look at the charts below. 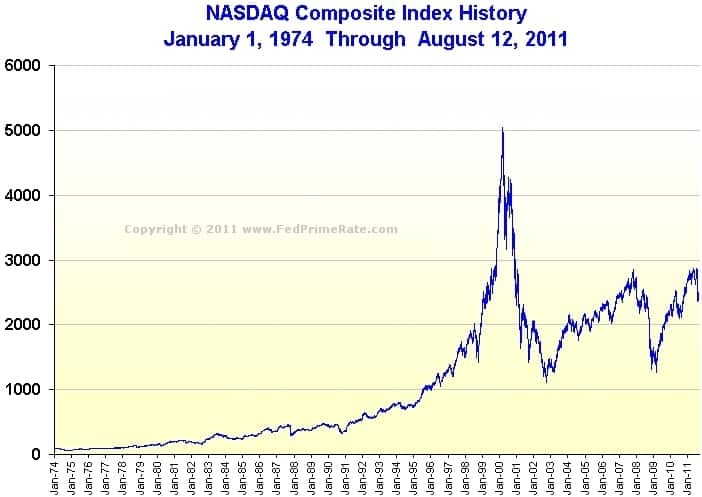 The first is a chart of the stock market from 1974 – 2011. 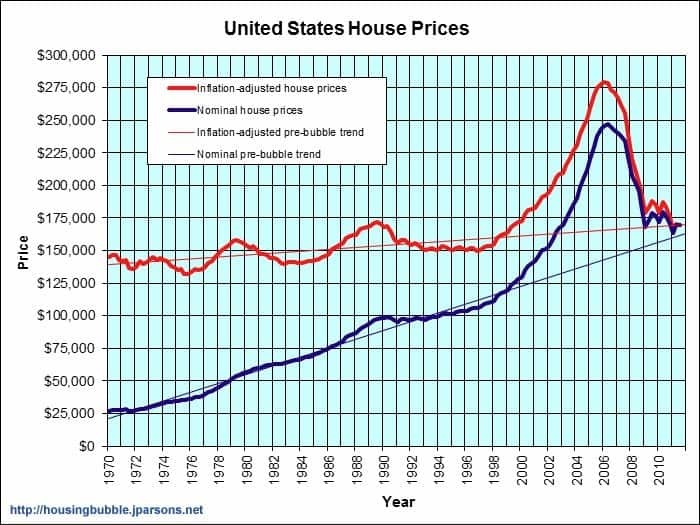 The second is a chart of housing prices in 1970 – 2011. 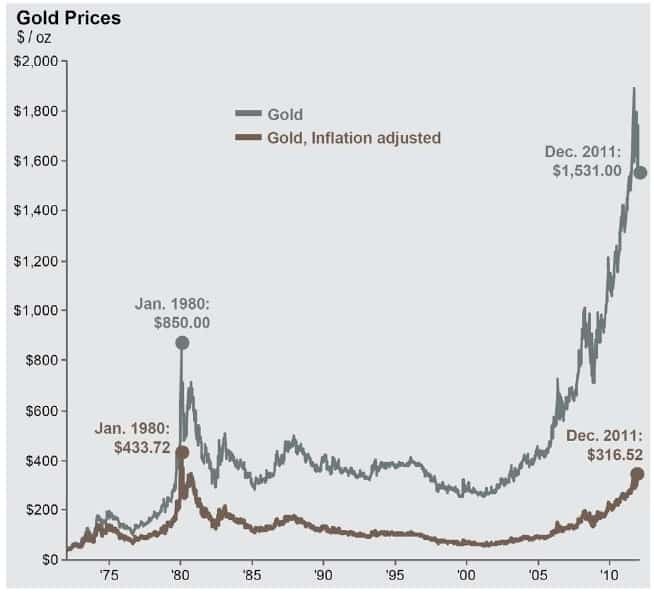 This last chart is of the price of gold from 1970 through 2011. Does anything look familiar with these charts? They all had a large run up followed by the bubble bursting. I know what you are thinking, “gold isn’t like those other times.” Or, “this time it’s different.” These are the same things people said when stocks were rising during the dot-com era and when housing prices were doubling overnight a few years ago. Heck, people were saying the same thing during the tulip craze in the 1600’s! In each instance, the same thing happened: there was an unsustainable run-up in prices, followed by a steep drop, bringing prices back in line. You can even see a gold bubble popping in the early 1980’s. For roughly 20 years, the price of gold has been flat. I agree that it is due for a rise, but not the large rise that we have seen. Think back to the late 1990’s. Remember how everyone was talking about technology stocks and how you should invest in ABC company because they are coming out with a new product that will revolutionize the writing industry? The new pen will simply be your fingertip and when pressed against a piece of paper, ink comes out. You need to buy this stock!! Or a few years ago when you would go to your son’s baseball game and the hobo told you how he bought a house last week for $400,000, put a picture just inside the front door that read, “welcome to our home”, and as a result, sold the house yesterday for $100,000,000? When situations like the above start happening, when the average joe is telling you what to invest in because it can’t lose, that is a sign to you that you need to steer clear of that investment because the bubble is about to burst. Gold is there now. Every magazine and newspaper has an ad in it telling you they will buy your gold. Late night infomercials are selling you on the two things you need to do in order to cash in on the gold craze. Other infomercials are trying to sell you rare gold coins. They use the argument that the value of the dollar is dropping and the only real commodity is gold. I question the relevance of gold in today’s society. Yes it makes great jewelry, but that is about it. If the worst-case scenario happened and the dollar was worthless, do I really need gold? I would much rather have food than gold. I would much rather have a warm, safe place to live than have gold. I feel that the reasons given for gold’s rise are not valid today. Personally, I would not invest in gold at the current price. I think that the bubble is about to burst.